The Mosquito is one of the two designs of Sig Sauer that correspond to the family of 22 handguns. This model is the MOS-22-B with a fixed barrel and standard features. It comes in a plastic casing, lock and key, a manual to help in the usage, an extra recoil spring as well as a second magazine. The Mosquito is quite different from other models of Sig Sauer when it comes to its making. The other models such as the number 1911-22-B, 1911-styled model and .22LR offering are all its own products. However, German Sport Guns or GSG originally makes the Mosquito. It is the first model released under the name of Sig Sauer, in which the barrel is permanently formed into the frame. The overall length of Sig Sauer Mosquito is about 7.2 in, with height and width approximately, 5.3 in and 1.5 in, respectively. It incorporates a barrel length of 3.9 in with a sight radius of 5.5 in. Its weight with the magazine amounts to 24.6 oz. The styling and exterior of the Sig Sauer Mosquito is very similar to that of the much-acclaimed P-series handguns by Sig Sauer. This is most noticeable in features of the magazine, breakdown lever, de-cocking lever and slide release. 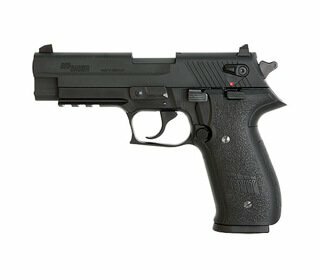 There is no practice required to use the Sig Sauer Mosquito if you have had experience with any of the P-series guns because the location of the usable buttons are almost similar. It also provides ambidextrous and slide-mounted safety features. The finishing of the Sig Sauer Mosquito is quite impressive as compared to other similar guns. The smoothness in the action of the slide is appreciable and racking is effortless. The accuracy and performance of the Sig Sauer Mosquito are up to the mark. The sights are yellow dots, front and rear, which are adjustable for windage only. Although not apt to be used as a self-defense weapon, it is easy to pick up the yellow dots, both front and rear. The sight is satisfactory because it is tall and the gap provided between the vertical edges of the front and rear sight are wide enough, thus, making it reasonably visible, while not too difficult to center the post. Furthermore, the low recoil feature provides a quick response to the target for follow-up shots. One of the most important aspects while owning a gun is to make sure it is user-friendly, which must include convenience in disassembly. The disassembly of the Sig Sauer Mosquito is simple and relatively less time consuming. In addition, cleaning does not require any special tactics or expert skills. The structural configuration of the Sig Sauer Mosquito makes it one of the best in the market when it comes to ergonomics. Built to fit the grip almost perfectly, it is customized for a range of hand shapes and sizes. Furthermore, it does not distract the shooter with heavy grip sensations or barrel drag. Overall, the Sig Sauer Mosquito is an inexpensive and decent trigger.